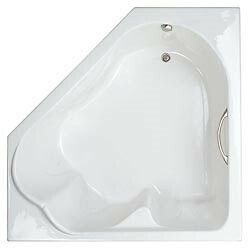 The captivating Castille 6666 is a total new dimension in a two-person corner tub with its spa-like features and size. A unique, contoured design provides three separate seating areas. Includes two pillows. Available as a soaking tub, air tub and whirlpool tub. Call 800-720-1062 for more details. 66" x 66" x 23.5"
Dimensions: 66" x 66" x 23.5"
Offering the best value, the Luxury Package combines all the bathing necessities with the luxuries that you’ve come to expect. Standard features include the SensaSelect 5-button control, a ten speed 2HP pump, grab bars on selected models, pillow(s) and color-matched or metal finish trim upgrades. Also included as standard features are the inline heater to maintain water temperature and a 20 LED Chromatherapy MoodScape light. Available as options are the nailing flange or removable aprons on selected models.